It's been a while, hope you're all ok. My time on the net can be counted in minutes these days so this blog has seen some neglect. My apologies for losing touch with everyone, but I've lost daytime access and evenings seem to vanish in the blink of an eye! Let's pretend none of that has happened and attempt a post. LEWISHAM lass Charley remains in Big Brother after the first eviction. The unemployed 21-year-old, who lives at home with her mum in Lewisham, entered the Big Brother house 18 days ago. She describes herself as trendy, wild and argumentative. On one side of a red-brick roadway, in a place called Lewisham on the south-east side of London, England, is a small, colourful food shop. A yellow and black sign above the front door says 'Honey's Caribbean Take Away Bakery'. A prolific bike thief who stole up to two machines every day, has been arrested after going on the run. 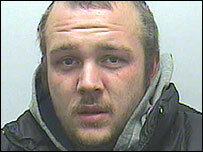 Daniel Westrop, aged, 27, from Bromley, south-east London, had failed to turn up for a court hearing on 24 May. The labourer was found in Catford, south London, and had been wanted for cycle thefts at stations in the South-East. A FIRE crew was called to an address in Sydenham following reports a man was threatening to jump off the roof. The crew, who brought an aerial platform as a rescue precaution, was called to the house in Devonshire Road at 8.15am by police. STAFF at a Sainsbury's store are complaining of coughs because of dusty building work. The shop in Lewisham Shopping Centre,Lewisham High Street, is being refurbished but one worker said this had led to a layer of dust settling on foods and fine particles floating in the air. POLICE have targeted nine stations along the crime "hot spot" route of the Lewisham to Dartford railway line. Eleven arrests were made on Thursday evening by British Transport Police and officers from the Met's Safer Transport Team. Offences include carrying a knife, possession of class-A drugs, trespass and public order offences. Im a Lewisham alum looking up current news!